Our future pictures are all about family...so thankful for my wonderful husband, beautiful and smart almost 2 year old and our baby boy who is due in May! Feeling full after a dinner of salad, pasta con broccoli, chicken parmesan,and apple pie! yum! This was the best picture I could get trying to get 5 kids 5 and under to sit still! Jack did so well with the kids. It was a great weekend with great friends! 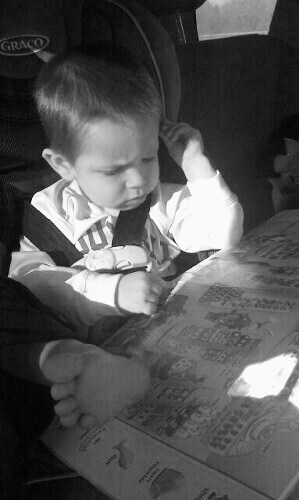 I love him the most when he is sitting in his car seat, reading a book, thinking hard with his hand by his head, and his little foot is helping hold the book up...too cute! This picture was taken 20 days after meeting each other for the first time. We went camping and to Elephant Rock and had a blast. This was our first "real" vacation...especially because we met, fell in love, got engaged and married so fast! We met July 4th 2002, got engaged on Mike's birthday, Aug. 31, 2002, and got married Dec. 28, 2002! I can't believe it was all within 6 months! I'm so happy I met and fell in love with this man. We had the best weekend! We made the trip to Indy to see Dan, Amanda, and the girls. Dave and Sarah Beth also came up which was fun. :) It was great to be able to hang out with them at their home, since it is probably the last big trip we will make before baby boy gets here. Evan did amazing in the car and slept so well...I think his cousins did a fantastic job wearing him out throughout the day! :) It was so fun seeing all three kiddos play together. Us girls even got a night out together, which has never happened! We had fun getting coffee, browsing books, and shopping at Target! The guys had fun playing video games, making forts for the kiddos, and playing video games! :) Picture overload coming your way!